The Chief Minister, Capt Amarinder Singh, today directed the Chairman of the Punjab Pollution Control Board, Mr Tripat Rajinder Singh Bajwa, to continue with the practice of issuing provisional no-objection certificates with regard to mega projects till a final decision was taken by the Union Government on this issue. 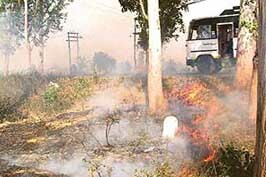 Despite warnings by the Punjab Pollution Control Board, farmers are resor- ting to wheat stubble burning in the fields. Thick clouds of smoke, emerging from the burning wheat stubble in the fields. Smoke emerges from stubble burning in the fields near the Gurdaspur-Pathankot road. Emissions from a local factory have proved bane of residents of Bahadurgarh in this district. Air pollution caused by the factory is so severe that they can not even sit in the open court yards of their respective houses. Dayanand Medical College and Hospital in Ludhiana has created a history of sorts by performing the first-ever bone marrow transplant in Punjab. 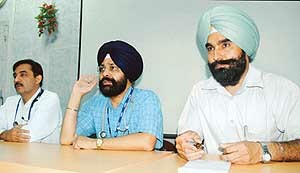 Dr Davinder Singh Sandhu (right), accompanied by Dr Daljit Singh, Principal, and Dr Sandeep Puri, Medical Superintendent, DMCH, addresses a press conference in Ludhiana on Friday. Absence of any crater either in the floor, on the road or any hole in the roof of the ill-fated Una-bound Punjab Roadways bus, and bodies of 14 of 15 injured passengers sans any splinter marks on them are strong and crucial indications, pointing out that there could be a “sudden fire” and not a “bomb blast-triggered explosion” inside the bus (PB-12-H-2304). Saying that the “true strength of a democracy lies in its justice system”, former Chief Election Commissioner and Punjab MP, Mr Manohar Singh Gill, wants the Union Home Minister, Mr Shivraj Patil, to ask the CBI to include the “massacre of 35 Sikhs” in its ongoing probe against the killings of five innocent Kashmiris by the security forces after the Chhittisinghpura killings. Mr Hardial Singh Kamboj, general secretary of the Shaheed Udham Singh Memorial Committee, has urged the Prime Minister to make arrangements to raise a suitable memorial at Caxton Hall in London where Shaheed Udham Singh had killed General Michael O. Dyer in 1940 to avenge the Jallianwala Bagh massacre. A member of the National Council of the CPI, Dr Joginder Dayal, said here today that his party would not be a part of the “grand political alliance” in which certain Akali factions were to be included. Factionalism in the local unit of the BJP came to the fore once again just two days before the arrival of ‘‘rath yatra’’ of the party president Mr Rajnath Singh. The Shiromani Akali Dal (Amritsar) handed over a memorandum to Deputy Commissioner here yesterday to be forwarded to Chief Minister, Capt Amarinder Singh, for preventing the proposed yatra of the BJP from entering Punjab. Residents of Punjab seem to be doubly cursed with the rising mercury and unscheduled power cuts. Information gathered by TNS revealed that rural areas of Punjab are facing power cuts for about 12 hours or more for a day, while the urban areas have been facing power cuts for four to six hours. The lead bank of the district, State Bank of Patiala, today organised a meeting of the standing committee under the chairmanship of Mr Devinder Pal Singh Walia, ADC (D), to review the progress of various government-sponsored schemes. Braving the scorching heat numerous residents of the subdivision today marched through the main roads prior to sitting on dharna opposite the office of the Deputy Superintendent of Police here. Certain Sikh academicians and intellectuals, some of them belonging to the late Gurcharan Singh Tohra camp, today held a meeting with the Punjab Chief Minister, Capt Amarinder Singh. The Guru Nanak Dev University (Non-Teaching) Employees Association led by Mr Sawinderjit Singh and Mr Surjit Singh Cholia, president and secretary, respectively, today condemned the attack by some unidentified persons on Dr Gurnam Singh, Dean Academic Affairs, about a couple of days back. Two workers were killed and two injured in a blast which took place in a steel factory here this evening. The Punjab Chief Minister, Capt Amarinder Singh, yesterday reviewed progress in the spheres of citrus growing , agro-juicing, organic farming, value-added horticulture and viticulture in the state. A plan to have one million hectares under citrus was also unveiled. A nexus between Principal of government senior secondary school, Dhapai, and certain officials of the Punjab School Education Board has come to light while flouting rules of the board by admitting a student to Class XI in December last year. The transfer of more than 2000 just-promoted ETT and JBT teachers in Punjab has led to a storm of protests from the transferred teachers. Mr Amrajit Singh, a senior lecturer and a social worker in a press note issued here yesterday urged the Baba Farid Health University, Faridkot, to change the date of Punjab Post Graduate Entrance Test - 2006 from May 14 as it clashes with the date of the preliminary examination of the civil services being conducted by the UPSC. The Punjab Government seems to have made up its mind to drop the move to privatise certain cooperative sugar mills in the state. After an informal discussion on this issue with MLAs of the Majha region, the Chief Minister, Capt Amarinder Singh, has convened a meeting of all concerned on May 5 to take a final decision.